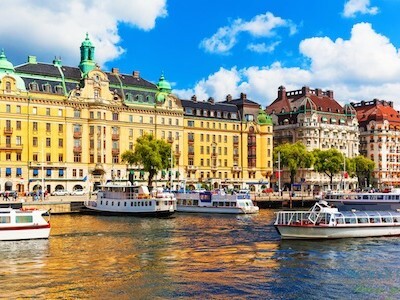 Translated from Swedish, Riddarholmen means “The Knights’ Islet.” It is located in Gamla Stan and is the home to several private palaces from the 17th century. The Riddarholmskyrkan church is its biggest landmark. From the seventeenth century to 1950, this church served as the burial ground for Swedish royals and monarchs. This is one of the oldest structures in Stockholm and dates back to the Middle Ages. At its west end, the island boasts of a wonderful photogenic and panoramic view of Riddarfjärden, a bay which many photographers and journalists often use in their reports and projects. Birger Jarl, traditionally known as Stockholm’s father, has a statue erected in his image in front of the Bonde Palace, which is located just north of the Riddarholmskyrkan. More buildings of note include the Old National Archive in the east, the Old Parliament Building in the southeast, and the Norstedt Building (the old Norstedts printing house). The Norstedt Building’s tower roof has become a permanent fixture in the city’s skyline, especially when viewed in silhouette form. Many of the newer buildings in Riddarholmen today were built later on – in the 17th century – a time when a more aristocratic nature ruled the island. If you love old buildings, traditional architecture, and ancient stories come to life, then Riddarholmen is a must-see the next time you visit Stockholm. It all sounds good on paper – but it is even better when experienced first-hand.